The first part of this post covered cartography more generally and my more general books. You can read it here. This post is going to look at three of my more specific books on cartography and what they show us about the story of maps. In the last post I looked at Theatre of the World, History of the World Map by Map, Visions of the World and The Map Book. In this post, I’m going to examine The Writer’s Map, Metropolis: Mapping the city and The Art of Cartographics, each of which have a different perspective on the world of cartography. I’m going to begin with The Art of Cartographics, because it is the most general and leads on well from the books discussed in the last post. The Art of Cartographics is a fascinating look at modern mapping and the many different ways that are used to make maps, not just of place and landscape. This isn’t a book that looks at Google Maps (see my previous post of that discussion). This book includes maps of everything from literary London, transport systems in Russia, world maps, a map of the global market for cacao. These are by and large physical maps, created in everything from a concrete wall, pins and stress balls. There’s folded maps, maps that unfold to make shapes, maps shaped from tree branches and maps that come together to make a person’s face. These maps are made from paper, lights, stamps, stone and even honeycomb. The book explores the multiplicity of ways we express our world and our knowledge through cartography. Basically it’s a fascinating book, that is well worth having a copy of. Sadly though, I can’t write about every map in the book. So I am going to focus on three. One is a world map made entirely of honeycomb, two is a literary map of London and three is the map of the NASA jet propulsion laboratory. Between the three of them they represent a good cross section of the types of maps included in the book. A non geographically accurate (but recognisable) map rendered in a non conventional material, a conventional material map of a concept over-laid geographically, and map that is a useful navigational aid, but also tells a completely seperate story. I’ll start with the honeycomb map. As you can see above, it is a world map created by honeycomb. It is the work of artist Ren Ri, in a collaboration with bees. It is an artwork in its own right, much like many of the earlier maps, which were created as visual masterpieces as much as they were intended to be useful. This map is very recognisable as a world map, though it is a slightly different perspective to the Mercator projection that most people are familiar with. What I love about it, is how much of a collaboration the work is. Ren Ri created his work by carefully clearing part of the beehive and placing relief maps in. The bees then moved back in and laid their honeycomb over the top. The work of the bees makes the map almost appear topographical, to me it looks incredibly tactile as well. This map represents central London with characters from the pages of books that are set there. London is such an old city, with such a strong literary tradition that 250 novels were drawn from to create this map. Each character has been plotted into the approximate area they lived or worked within their fictional world. As well as being a mine of fascinating literary information, this map also succeeds in being roughly geographically accurate. It is a wonderful representation of the many different concepts that can be expressed in map form. It also harks back to older forms of mapping such as the medieval mappa mundi, which aimed to present a view of the world rather than one of geographical accuracy. Like past maps it draws on tradition, in this case literary rather than cartographical. The third map I wanted to consider, is firmly rooted in the present. You can’t get much more forward looking that the Nasa Jet Propulsion Lab (JPL). This double sided map was given to all employees at the 76th birthday party and is still given to all new employees and interns at orientation. JPL is so large that even employees need GPS to find their way around sometimes, and the buildings are not blessed with sequential numbering. This map is intended not only to be a useful navigation guide, but it also tells the story of JPL and provide several different walking tours depending on what you want to see, and which part of the story you want to discover. So it serves as both a navigational aide and as a depiction of JPL’s narrative, as well as being an art work in its own right. In many ways it is a combination of all the characteristics of the first two maps discussed. Additionally, despite being so modern, it still holds to many traditions of cartography, especially the pictorial depiction of creatures that inhabit the physical space, or mythological space of JPL. There is a real sense of ‘here be dragons’ (a concept used for unknown territory) and in the tradition of peopling maps with fantastical creatures. These three maps are only a taste of The Art of Cartographics, there’s many truly incredible and fantastical maps in its pages. It illustrates the many fascinating ways maps can be used to express the human experience and gives hope that cartography is not lost in the past. Continuing with maps in the real world is Metropolis: Mapping the city by Jeremy Black. Black covers a lot of ground chronologically, starting with incredibly early civilisations like the city of Nippur in Mesopotamia. In c.1250BCE it was depicted on a stone tablet when irrigation canals were built. The writing on the map is cuneiform. What is truly incredible about this map, is how recognisable it is as a map of a city, even though it is only a fragment and is thousands of years old. This is a map that was clearly intended to be useful. Nippur was found on the Euphrates in what is now Iraq and it was a religious centre for most of its existence. Originally it was dedicated to Enlil, by the time it was abandonded in around 800CE it was a Christian city. The map is depicting the Euphrates on the far left, emerging from it up the very top is a canal that continues into the city. You can also see the city walls and a moat. It is truly remarkable how readable the map is even after all this time. Black continues on through other very early city maps, through medieval maps of major cities like Jerusalem, London and Cathay (most of which tend to be very pictorial), on to grand Renaissance cities, with appropriately grand maps. He then examines, new world maps as the Europeans began to spread out across the world, through the epic imperial maps of the 1700s to the 1800s, the maps of innovation in the 1800s to 1900s, the global maps of 1900s and 2000s and concludes with the future possibilities of mapping cities. What is clear in Black’s depiction of millennia of city mapping is how much a city’s identity can be caught up in its maps. This is never more true than in some of the, arguably, most powerful cities; the Renaissance city states. An example is the Carta Della Catena, a map of Florence from the 15th century. Unfortunately the image you can see below is a 19th century copy because the original was lost in a Berlin museum in World War II. What this map illustrates is not only Florence at the height of its powers, but a period of transition in cartography. The map is still pictorial and in a sense representative rather than geographically realistic (that’s the artist in the bottom right) as you would expect from a medieval map. However, there is the real beginnings of realism as we’d understand it in a modern sense. It also illustrates the layout of Florence very recognisably and shows quite clearly just how important the city was. Black’s book is a really interesting exploration of mapping cities, and much like Art of Cartographics, it is not too Western focussed. It draws on city maps from all over the world. It’s certainly worth reading. I wanted to finish off my exploration of mapping and the books on mapping that I own, with something a little different. While all the previous books have been very much rooted in real world cartography, The Writer’s Map edited by Huw Lewis-Jones is a look at maps of fictional worlds. Lewis-Jones edits a book of chapters both by writers who have had maps of their worlds created and by those who created the maps. What is most fascinating about this book is how grounded in real world cartographic history these fictional maps are. I received this book for Christmas and spent two days sitting on the deck doing not much else but reading it. It is truly absorbing. I’d love to be able to explore every map discussed with such genuine enthusiasm, but that would defeat the purpose of this post (just buy the book). So I’ll focus on three very different but classic fictional maps. Middle Earth, Hundred Acre Wood and The Marauder’s Map. Most people these days are probably most familiar with the maps created for the movies, but I wanted to use the map from 1970 by Pauline Baynes. I chose this map because Tolkien gave her detailed instructions, including the colour and size of the different ships and where different creatures should appear. It is also, arguably, the progenitor of fantasy mapping. The maps of Middle Earth are very much steeped in the history of mapping and they are not dis-similar to many of the epic world maps discussed in part one. In The Writer’s Map the Middle Earth chapter is written by Daniel Reeve who was one of the map makers from the films. 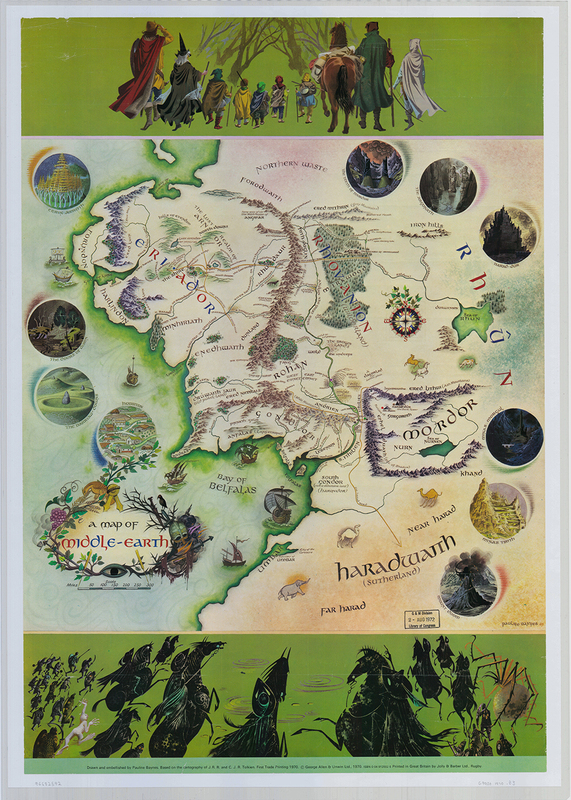 He drew on Baynes’ original map as well as mapping traditions and created maps that appear in the movies, but also as the background for the publicity materials. Reeves discusses the processes in making the maps, as well as sneaking the outline of Wellington harbour and his home town as the Gulf of Lune into a Fellowship of the Ring map. He also looks a at why we make maps and what they show us. The maps in Lord of the Rings have become the visual mainstays for the immensely complex fantasy world Tolkien created. On a much less epic scale, but of equal importance, is Winnie The Pooh’s Hundred Acre Wood, as drawn by Christopher Robin with help by Ernest Shepard in the 1920s. It was inspired by the real Ashdown Forest and, while simple, perfectly encapsulates Pooh’s world and the world of a child. It gives the world of the book a physical presence. You can see all the important geographical features of the story including: Pooh’s trap for Heffalumps, big stones and rox, Eeyore’s Gloomy Place (which is rather boggy and sad) and of course the directions for the North Pole. The map is in some ways like the city maps I discussed earlier, it depicts the totality of a world, not necessarily with geographical accuracy, but showing what is important to the creator and those it is created for. From the perspective of the Winnie the Pooh stories this map shows its heart. Shepard also did the maps for the Wind in the Willows and along with Hundred Acre Wood, they went on to create a tradition that can be found in many Western children’s books. The Marauder’s Map from Harry Potter is a tricky one to show, as part of its appeal is the way in which it depicts people moving around Hogwarts, but it is such a crucial part of the books that I couldn’t leave it out. The Writer’s Map also has a fascinating chapter by Miraphora Mina, one of the creators of the Marauder’s Map in the films. She’s one of the creative team who worked on the Potter films and is now working on Fantastic Beasts. Mina knew that the Marauder’s Map had to be special; logical and bewildering at the same time. They made it from scratch, everything hand cut and folded, glued and written. In many senses it was like the early maps, only for a school inhabited by wizards. She made more than twenty maps to be used in the film, and their physicality blurred the line between fantasy and the real. Although these props can’t really show people moving around on them, in creating a map it made a world physical, there in ink and paper. This is true for all fictional maps. They bring their fantastical world into the real. You can trace the Lonely Mountains with a finger, follow the borders of Tortall, understand how the Island of Berk fits with its surrounding geography or see the route taken by the Swallows and Amazons. Fictional cartography gives real world substance to the fantastical, partly because of the long and understood history of cartography.